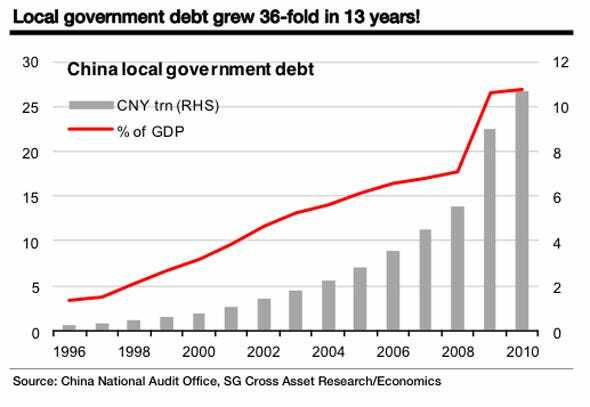 Local Debt in China has increased dramatically in the last 13 years according to Business Insider. % of GDP is left scale. 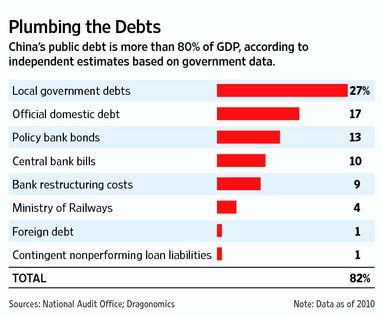 This local government debt makes up the biggest part of total China public debt as the Wall Street Journal shows.. The Economist says: So, is there a problem here? I'd say yes and no.. But that's not to say that debts aren't a problem. I think a near-term economic crisis within China is unlikely. But I also think that many of the economic policy choices that make China's debt less of a near-term threat are likely to seriously complicate growth 5 or 10 years down the road.